There's something awesome about rock gardens. But they can be painful too! It started off well. 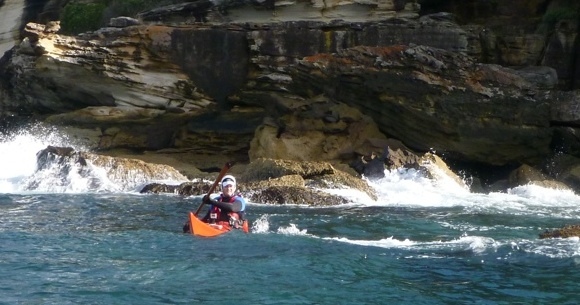 Mike, Lt. Gelo and I met at Sydney Harbour Kayaks at the start of a magnificent Saturday morning. We kitted up in protective gear – wetsuits, booties, helmets etc – and set off for Grotto Point looking for some fun in either surf or rocks. The weather report for the morning looked great (seas a little under a metre and 13knts of wind) and we couldn’t wait to get amongst it. Mike in his new helmet and wetsuit looked more like a Navy SEAL than a paddler! But beware of enthusiasm! When we arrived at Grotto Point the seas were slight and the rocks looked inviting, and I zoomed ahead of the others and made straight for our usual starting rock garden, riding a small wave in before jamming the paddle into the drink to bring me sliding in behind a good sized rock. At this point I felt excited to be in the zone and looking forward to the fun about to commence. What I didn’t do however was look over my shoulder to see what might be behind me, because at that exact moment a big once-an-hour bommy sucked the water out from behind the rock, dropping me down a couple of feet right in its lee, before jacking up and crashing over the rock itself. Of course I didn’t have time to take much of this in. All I knew was that I had suddenly dropped, and in that split second of realisation, spun my head around at the exact moment a wall of water crashed over the rock directly into my face. 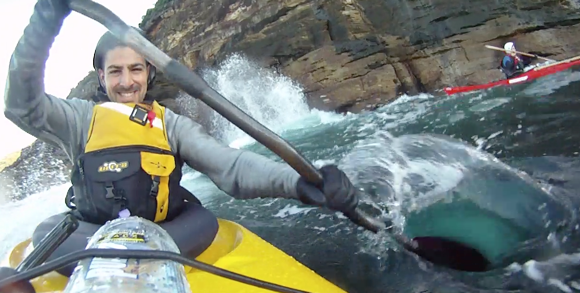 At the moment of impact I threw my weight and paddle into the wave, expecting it to carry me side-surfing into the rocks behind me. Instead I seemed to burst through the wave and was now leaning and bracing in exactly the wrong direction to stay upright, and rolling down the back of the wave toppled over and past the point of no return. 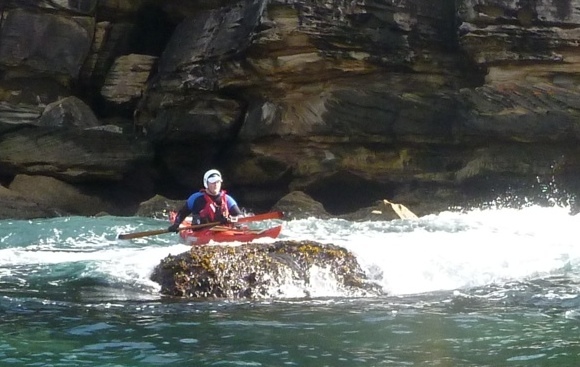 Everything slowed down as I teetered on the very edge for a split second, then as I started to roll my paddle hit rocks below me, and my first thought was to prop myself up with my paddle. However another wave sucked the water out from below and I toppled upside down and under the water, landing head first on the rocks below. As the next wave rolled over me, it picked me up (still upside down) for the briefest of moments, before slamming me back down onto the rocks. 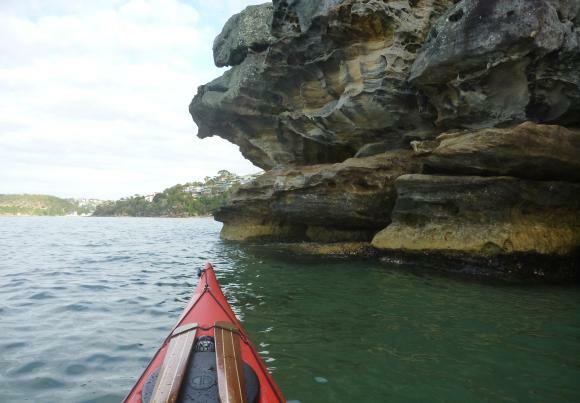 Despite the pounding I was getting on the rocks whilst upside down and locked in my kayak, I was amazed at just how calm I was. I’ve never tried to roll in a combat situation before but, as I peered through the frothy green water around me, I figured that now might be a good time to start. 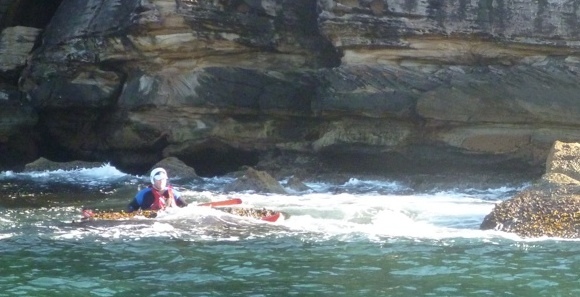 I quickly setup for the roll but again I was smashed down and pinned against the rocks below me – I now couldn’t move my body at all, let alone my paddle. Still, as my boat got picked up by the next wave I started to sweep out for the roll when my skirt and legs were ripped from the boat and I emerged at the surface, paddle in hand but out of the boat. The water looks soft and frothy, but as I discovered, it hits the rock with force! 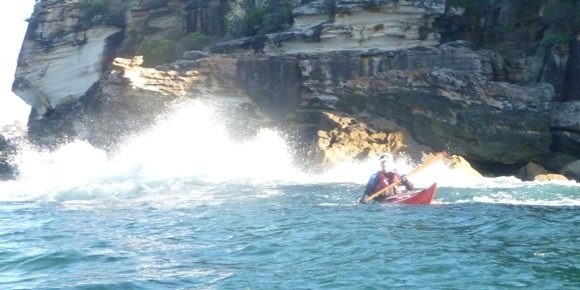 The first thing that hit me was the next wave, smashing me against my boat which was rapidly filling with water. 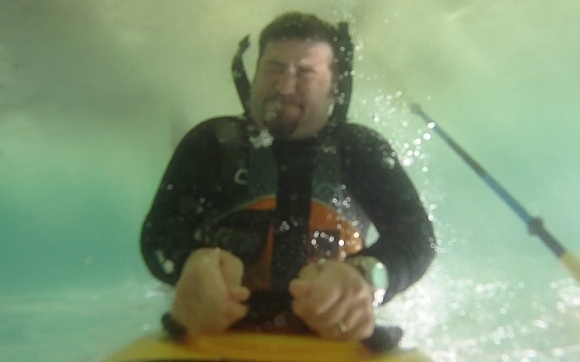 I slipped my paddle under the bungees and dragged the boat around facing the oncoming waves. The big rock was still between me and the safety of deeper water, and I was keen to get the boat out of the way, so as the next wave poured over the rock I launched my boat nose first into the wave, over the rock and out towards Gelo and Mike. Now I had the problem of getting past the rock myself so I could swim to safety. Sometimes I could stand on the rocks below, other times I couldn’t, so as the next wave came in I launched myself onto the back of the rock, scrabbling up to its top. As I perched there I realised how vulnerable I was, as the next wave hit and swept me off it backwards (I’m sure I heard Lt. Gelo laughing at this point!). I climbed it again on the next wave and then launched myself immediately off it, thankfully into a lull between waves where I was able to swim out to Mike and Gelo who were now holding my boat. When I got to the boat I took stock of the situation. I looked to see how far we were from the rocks, and helped by the outgoing tide, realised they were no longer a danger. Then I took stock of my own physical condition – the wetsuit was keeping me warm, but my right shoulder felt like it had been run over by a truck. I wondered if it might be dislocated but it seemed to have a full range of movement so I put that thought out of my head. Next was talking Mike through his first assisted rescue. He dutifully followed my instructions, emptying my boat of water and then steadying it for me to climb back aboard. I think he was amazed at how quick the rescue happened, and within a few minutes I was back in the boat sucking in some deep breaths to recover from the ordeal. I also realised at this point that I hadn’t turned the video camera on and had missed the entire episode (again!!). If there’s anything I’ve learnt from my many ordeals it’s that sometimes you need to get straight back on the horse to ensure fear doesn’t keep you in its grip later on. I looked at the rock garden, and that big bloody rock in the middle, and knew I had to get back in there and beat it, so I pushed off from the boys and charged straight back in, this time keeping a closer eye on what the waves were doing around me. Ok rock, you haven't beaten me yet. Bring it! 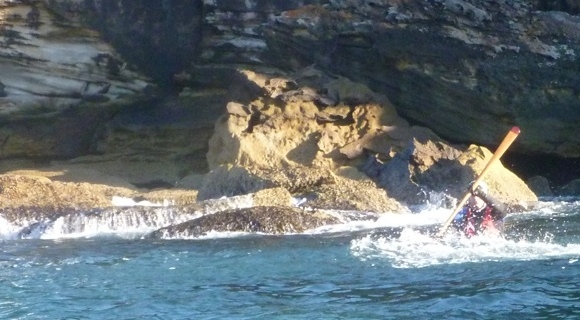 And then punching in through the wave and over the rock. Owned! For the rest of the morning we played without incident. 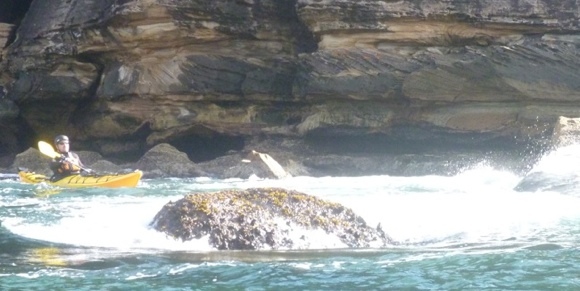 We bounced around in rock gardens, paddled the Grotto Reserve cliffs for a while, and sat off the Dobroyd bombora watching it’s awesome tubes in the southerly swell. Then we head back to the rock garden for a last play before starting the calmer trip home. On the way back a couple more things happened. 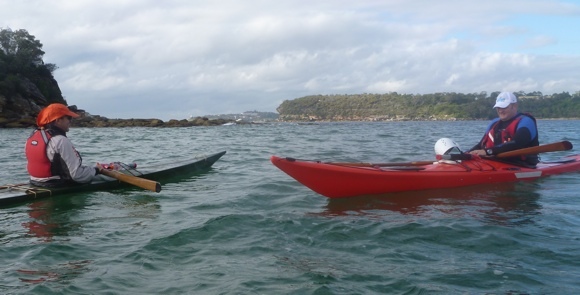 First we met Terry in his magnificent Skin On Frame kayak, complete with home-made Greenland paddles. We stopped for a lengthy chat on the boats he’d built and how they performed in various conditions before he set off again. Then as luck would have it Garry arrived in the coffee boat, allowing us to stop and drink fresh frothy coffees by the edge of the rock gardens we’d played in earlier – brilliant! 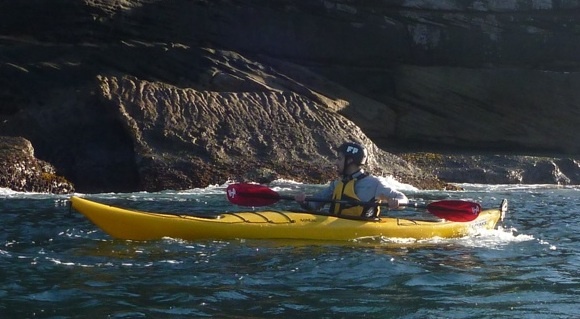 Terry and his SOT kayak and Greenland paddle. Beautiful! Garry and his Coffee Boat. Equally beautiful!! When we got back I had time to think about what had happened. How should I have reacted differently, what should I have done to keep myself in my boat, what did I do when I swum to safety that might have been done better. Instruction and reading is all important when developing skills and knowledge, but there’s a lot to be said for learning from experience. And importantly, it’s far better to have friends around to help you if you do run into trouble. Mike later demonstrated his wet exit technique. Really, really great piece, FP. Hope the soreness doesn’t linger. Rocks ARE hard! Times like these, I’m glad my boat isn’t plastic and I can’t be teased into risking the rock gardens with you, mad buggers that you are. Glad to hear you made it out ok mate, I don’t want to see you on the nightly news getting winched into a helicopter, ok? 1. I’m really glad you are okay, FP! 2. 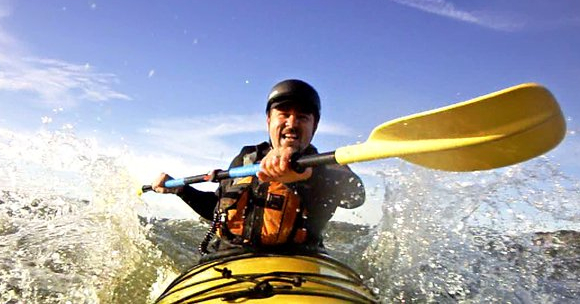 You were smart to wear helmets, PFDs, and wetsuits, as they all protect you from impact and abrasion. 3. “Never turn your back on…” is a good lesson. 4. It’s imperative to practice various rescues with your mates and to discuss what you and they will do should the spray hit the fan. 5. You did the absolute right thing by going from Plan A to Plan B to Plan C to Plan D as the rocks and waves had their way with you. Never give up! 6. Never let your head hit rocks. Always spin, maneuver, whatever it takes so your hull takes the beating and not your body. One of my posts (“How to Hit a Rock”)describes this in more detail. 7. Now you know why we call it the “School of Hard Rocks.” Do be thoughtful and scout and pay attention, but the only way to get proficient is to go out there and do it. Just as you did. G-e-r-o-n-i-M-O! Coffee Boat? Brilliant!!! We need one of those in our harbor. Wow that was quite a beating. I second Eric’s suggestions and might add to watch a couple of sets go through before heading in to play in the rocks. Even on well known spots, its good to reassess as things change with different swell directions and periods and tide heights. Keep charging it Fat Paddler!!! Thanks Cate. Yeah, it was totally my fault – I know the area well, the swell was small, it looked ridiculously easy, and as a result I was too eager and not careful enough. It certainly taught me a good lesson though – I won’t make the same mistake again! Gripping story FP! 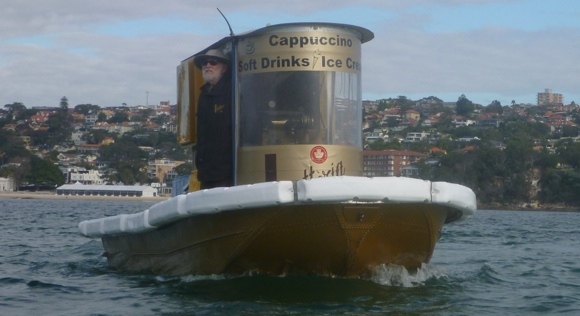 Very little will get my wife in a boat – certainly not being chucked around like socks in the washing machine, however, she admits the thought of a coffee boat may just do the trick! Yikes, FP. Bravo for getting back on the bronco that bucked you off so rudely, and glad that you came through intact. 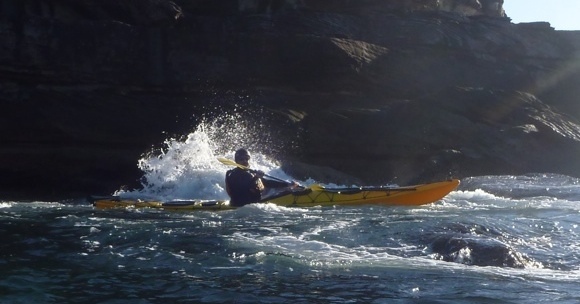 I’ve often said that any paddler who has the courage and generosity to share his or her mishaps with fellow paddlers has my admiration and respect. Thanks for sharing this trial-by-water with us, mate. any coffee boats Up Over? You mates really are livin’ large! Glad to see that you were safe! It’s amazing how you stayed calm throughout all that, it’s one thing to have as a reminder, but to actually do it, it can be hard to apply sometimes. Yeah, I think the key to it is to enjoy being in the water. Many rock gardeners are people who spend more time in the water than on top of it. 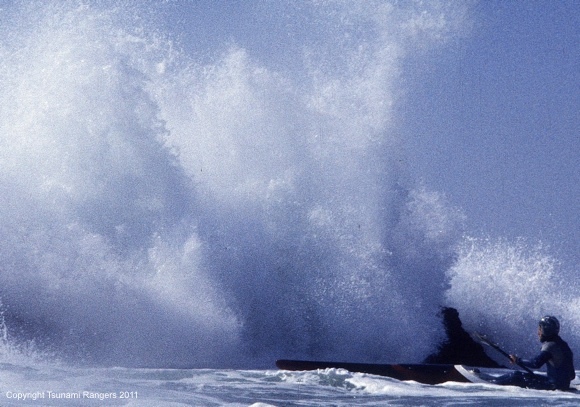 I’ve always been in the water – surfing, body surfing, swimming, and often when paddling! When surfers get thrashed in dumping waves they learn to relax and go with it until the energy dissipates, rather than fight it. nice one, experience is what counts and now you have some> what do they say? good judgement comes from experience and experience comes from bad judgement. glad to see you have a helmet and love your coffee boat.